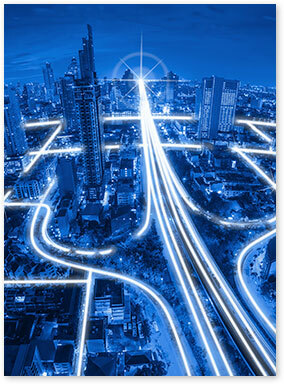 EM3 Networks offers the most flexible ways to move your traffic from point to point or from user to user. Our scalable solutions grow easily with your business or your traffic demands. Move data more quickly and gain greater network control and security across locations and between users with MPLS (multiprotocol label switching). MPLS can carry many different kinds of traffic, including IP packets, with high speed and high performance and quality of service. Its easy to add locations to your network, saving time and costs on network configuration. Multiple classes of service (CoS) enable your company to create separate settings and priorities for different types of traffic, reducing latency and pipeline congestion. Software-defined WAN for multi-site network connectivity lowers operational costs and improves resource usage. SD-WAN can manage various types of connections, including MPLS, broadband and LTE. Ease of deployment – no hardware to install. Routing and switching, movement of data and digital voice traffic is kept within software. Central manageability – manage your organization’s entire WAN through a single interface. Change network configurations such as bandwidth without the need for on-site technicians in different offices/locations. Get notifications of potential problems so they can be handled proactively. Simplified architecture and software save money on infrastructure and staffing.